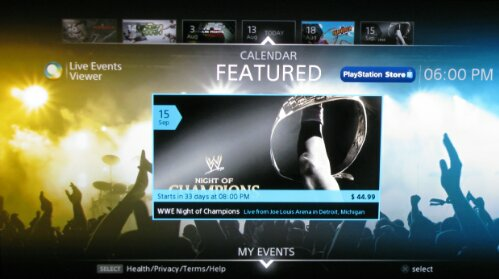 Sony is adding to its PlayStation steaming services again with the introduction of the new Live Events Viewer. We heard all about the Live Events Viewer at E3 and it sounded pretty decent. Well as of today it is available and PlayStation users can now buy and watch pay-per-view events starting with WWE SummerSlam this Sunday. Sony has announced that events will be available on a weekly basis and as well as the PPV content there will also be some free stuff available. If you have a look you will see that at the minute there is only UFC and WWE specials. US PlayStation Blog has told readers that concerts ,races and “other entertainment events” are not far away. Let us know what you think of the new service below.